I’ve never been on an ultra cruise. So far it seems that the ultra is like a premier, but more and bigger prizes. For example, a $2k drawing nightly, plus more games to win more money. Are they still giving a nice gift to each Ultra invitee? Yes. iPads, iPhones, apple watches, a few computers, cash, a big tv. The problem is there are about 300 guests and their companions ( at least on this sailing). So, lots of competition in the drawings, and the casino is always packed. I thought maybe they did away with the individual gifts since there are so many drawings. That is a lot of invitees and guests. I could see, it would be more difficult to get picked for a drawing. I was on a Premier Plus in September and there were only 30 to 40 invited, plus guests. They had many drawings and me and my husband got picked six times. It was not crowded at all. We loved the Premier Plus. I will be on the Breeze next week for the Ultra and I guess it is going to be packed. Thanks for posting the events. I guess the Breeze events will be similar. Is the 12:30 am drawing for $2000 for free play and do they keep calling till they get a winner? Good luck in the casino. They draw until there’s a winner for the $2k. Thanks for the info, gmblr. Looks like more activities and drawings than last years Ultras. I got a similar offer. Just got back from a Premier Plus on Horizon today, and found the same 4 Dec early access offer in my email this morning. (Although mine’s only a free interior and $500 casino cash). Looking forward to booking my first, but not last (if my points on Horizon have anything to say about it 😂 ) Ultra cruise! Those that have early access please let us know bright and early, lol, tomorrow whats offered. We both got the same Ultra teaser but can't book until the 6th but hopefully someone really nice with early access with fill us in. This will be our first Ultra to book so are excited! 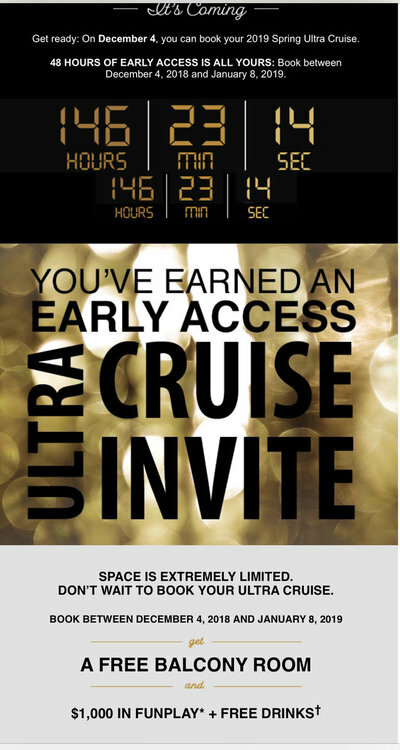 The ultra cruises showed up for me at about 12:05am eastern time. There were only 6 available dates, seven different cruises. I signed up for April 27, because I’m coming back from a premier on February 21, already booked on an elite cruise for March 17 & another regular premier on March 30. While I’m looking forward to the cruise, I’m not looking forward to hundreds of dedicated gamblers crowding the casino, and competing against me in the drawings. Thank you!! Wow your getting some days in and I agree with not looking forward to the casino being busy and too many names in the hopper for prizes! These are the same ones I have to choose from. Kind of disappointing. Oh well! Maybe next time! I’ll see you on the Sunshine - that’s the one I booked. None of the others worked since we’re doing the 24-night Transatlantic on 4 March, then spending about 2 weeks in Europe afterwards. Hoping for a late fall/winter 2019 Ultra or Elite though! The latest elite I saw for next year was the dec. 1 on the legend. 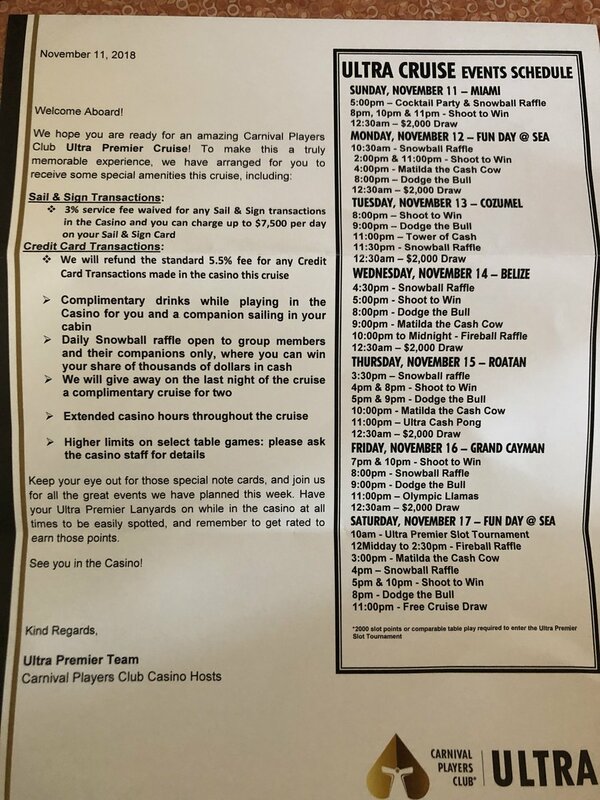 gmbler, Thank you for the list of cruises. I will look at the Magic as it coincides with my granddaughters spring break and they love that ship. But that would meaning cancelling the Oasis on March 31. Decisions, decisions. I like your offer better gmblr. I got to book on December 4th but had to pay for my room and getting 500.00 in funplay plus free drinks. I booked for April 6th. This will be our second Ultra. We'll be there too! 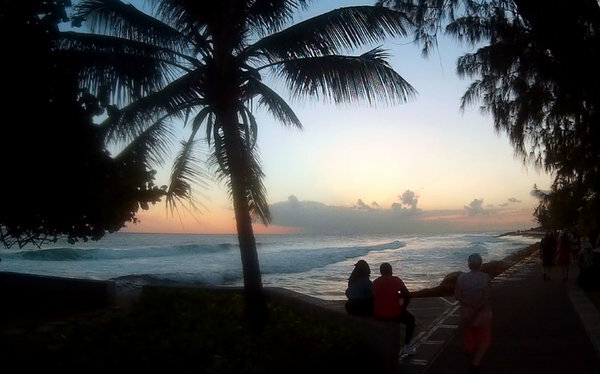 Was so afraid that the Sunshine would close out before we got a chance. We have offers from Princess and Holland that we are taking advantage of so the April 27 was the only one that worked for us. All set now! 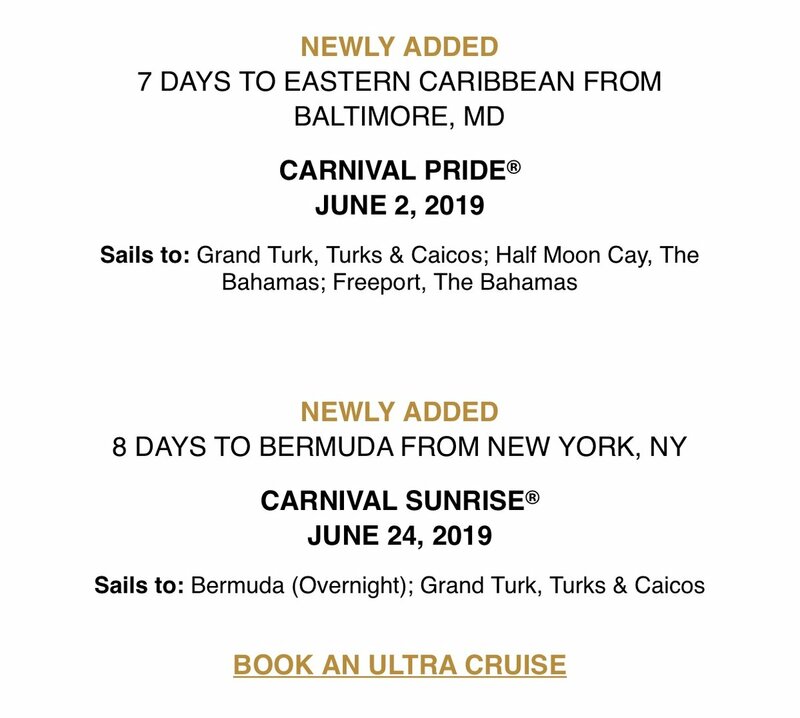 They added two more ultra sailings. One from MD June 2, one from NY June 24. Question to those who've been on an Ultra cruise. I know you get free drinks in the casino only. Has anyone gotten a discount to upgrade to the full Cheers beverage package? 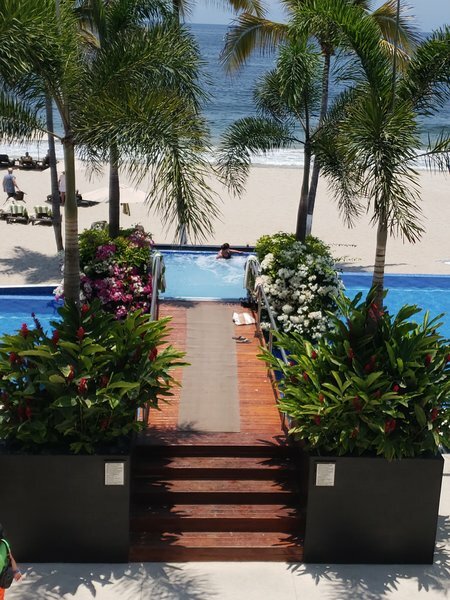 Drinks at the pool, dining room and other bars can quickly add up. I’d guess no, but you could always ask guest services. Or, just take an elite cruise as it’s included. The only Elite cruises I've been invited to were bad dates for me. Earlier this year they offered an Elite 19 day balcony from Singapore to Sydney on the Spirit plus $2500 for airfare but it was the same time as a Celebrity cruise I had booked. Pretty good deal if I could take it, especially considering I've only sailed Carnival in the past decade for one 5 day sailing in 2017 and a 4 day sailing in 2013. I finally accepted their Ultra offer on Sunrise on June 24th for 8 days. Balcony plus $1000 casino cash. Timing worked and it leaves from NYC (I'm in NJ). Just need to figure out the drinks. 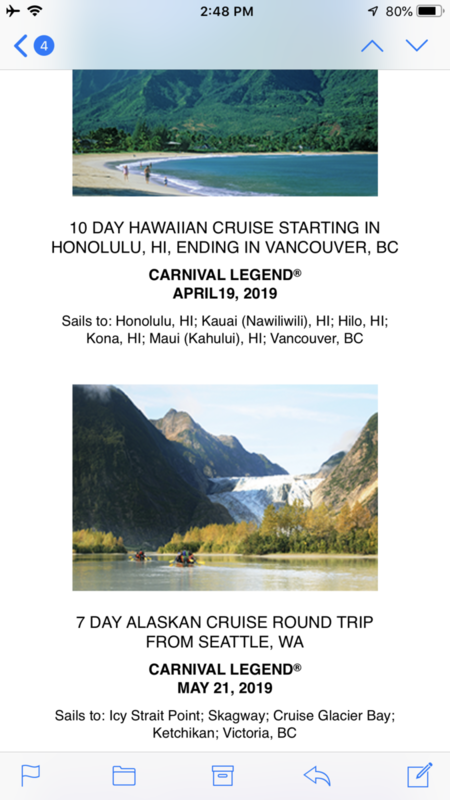 FYI, Some elite cruises for April and May came online today. I've never gotten the Elite offer. I don't think that I'm a high enough roller.